I have some exciting news to share with you. We are remodeling our bathrooms! 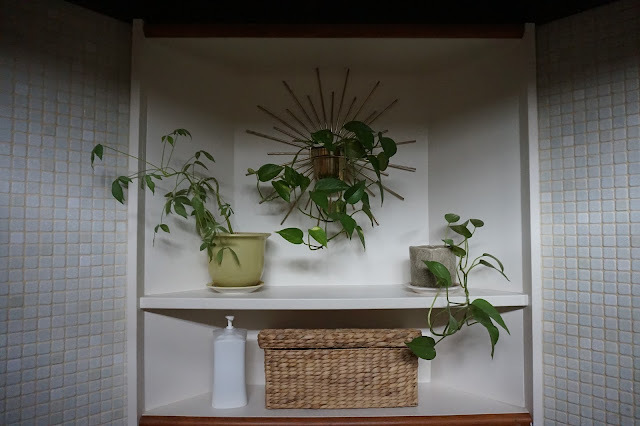 Maybe it's just me, but I could spend every day's lunch break walking through tile shops, designing the perfect bathroom in my head. I finally made some decisions on tile and they are starting the demo as I type! Here are some before photos. The wall to the right is actually staying in all it's 80s trim glory. We are trying to keep the cost down and the tile is nice and neutral, so it will stay on this wall. This is the problem area. The area around the tub is leaking and so we decided to gut it. 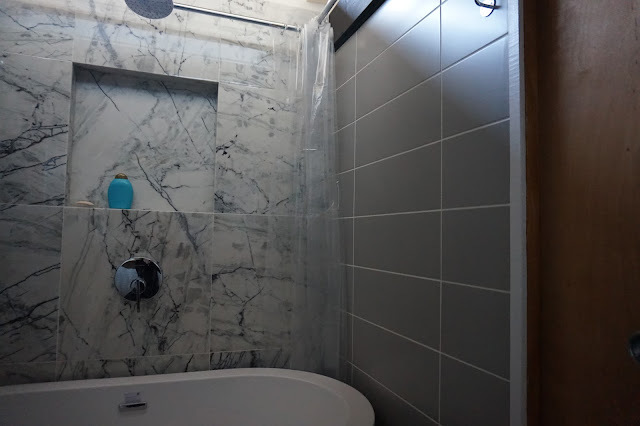 It's going to be a glorious standing tub, with the back wall covered in large marble tiles, and the sides in a large format grey subway shape tile. This room will become our dressing room, and the other side will have our bed. The one downside to all of this is that we have to sell our Crate and Barrel Tate Bed. It just won't fit in the new space. It's currently on craigslist, so if you're interested, hit me up! Are you looking for that special rug to finish off your perfect space? Or perhaps you are looking for an inspiration to make your space something special. One of these rugs could be it. 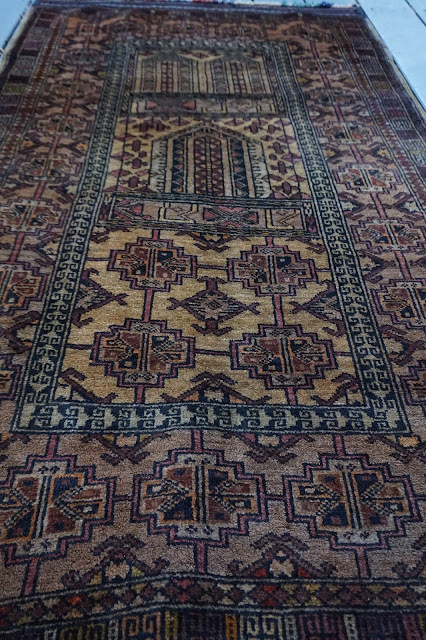 They are vintage Balusch rugs, which were hand crafted by Baluch nomads (in the Afghanistan, Iran and Pakistan area) approximately 30-60 years ago using vegetable dyes. This landscape scene rug has beautiful shades of orange, blue, red and purple. It would also look great as a wall hanging. I love the edges of this one, which has earthy tones of brown, yellow and red. I love the shades of blue and pink in this one. This last one has wonderful shades of blue and green, with just enough pops of yellow and pink to make it interesting. 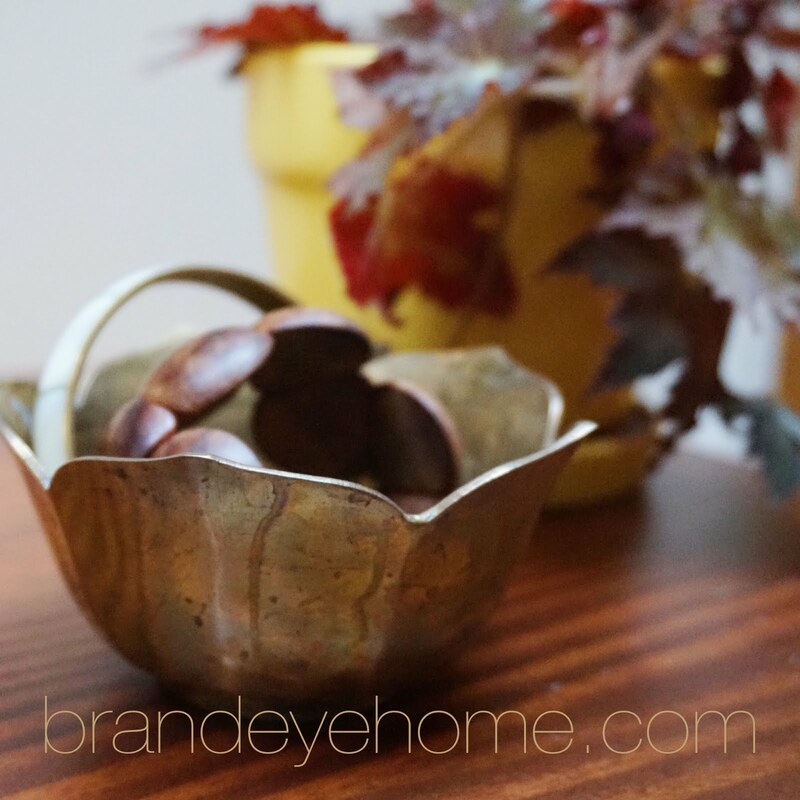 Check them all out in the brand*eye home shop! Wissahickon Valley park is a Philadelphia treasure. And lucky for us, we live very close to it. It is enormous (1800 acres and 50 miles of trails) and has so much history and cool geology. The park includes the only covered bridge in a major city, miles and miles of hiking trails, horse trails, historic statues and stone walls everywhere. The creek has a few dams which are left over from when it was home to many mills. It's incredible and there is always a new part of it to explore. It runs along the Wissahickon Creek. We spent a beautiful day hiking forbidden drive, up to see the statue of the an Indian chief, Tedyuscung, then to the Valley Green Inn for lunch. Every step of the way is an exploration, in a major city! We saw a blue heron in flight over the creek, turtles hanging out on logs, chipmunks, another heron scouting out his next meal on a branch, and finally we saw the Indian statue. I don't know how I just found out about that this year, but he was an amazingly cool statue who is looking out west over the creek. The sun reflecting onto the bridge. That's a Blue Heron on the branch, patiently waiting for his next meal. What is your favorite spot on the Wissahickon? I know there is so much more of it to explore. I've been selling them at my pop-up shop and at clover market, and posting about them on instragram and facebook, but haven't dedicated a post to them yet. So here they are, the Market East Pillows!! I designed the fabric and it printed through Spoonflower. Spoonflower is the greatest invention. You upload your design and pick the repeat type and voila, they print it for you. It's the coolest thing ever. I used a photo that I took of the Market East train station in Philadelphia. Currently the station name is actually Jefferson station, but I seriously hate when buildings are renamed, so I will forever call it Market East. Anyway, the station has a two huge walls of tiles that from far away you can tell are trees, but from most vantage points they just look like random angled subway tiles. I took a photo and did a mirror repeat to make a this cool design. This pillow was made with a full piece of the fabric on the front. The rest are a patchwork style. The quilting lines follow the lines of the tile at some points, then veer off at others. Here is a little summary of the process. Not included is me struggling and struggling to sew invisible zippers! Sometimes they are really easy, and other times they are very, very hard. First I chose some fabrics from my stash that coordinated with the fabric. A personal favorite is the shot cotton. It is a woven blend of two very similar shades of the same color, which gives it depth. In the middle of this I had to move the sewing area to our living room while we were re-doing the flooring. The flooring needs it's own blog post, which I will do as soon as I get some decent photos of the room. Anyway, having the whole dining room to myself was great! It has giant windows on each end, which was lovely. I started out making a big square. As you can see, this was in the spring :-) My method is to just work by adding rectangular pieces of fabric. It's an organic process and I don't use any patterns or have a real plan besides try to balance out the colors. Little bit of this, little bit of that and then it's complete. Then I cut the large shape into separate squares and added fabric as needed to make each the correct size for the pillow form. This gave each of them a different and distinct look, as compared to the modified log pattern that I started with. Then each was made into a pillow. I still have two left in the shop, so grab them while they last! I have a smidge more fabric left so there may be a few more in the future. But each one will be unique.